Targets stores and Target.com in the US are having a 20% Off sale on all Jurassic World toys this week, excluding LEGO. That discount will apply to the entire assortment though, including the new Dino Rivals releases! The excellent Bite ‘n Fight T-Rex is available in store and online for only $23.99, an incredible deal for this brand new figure! 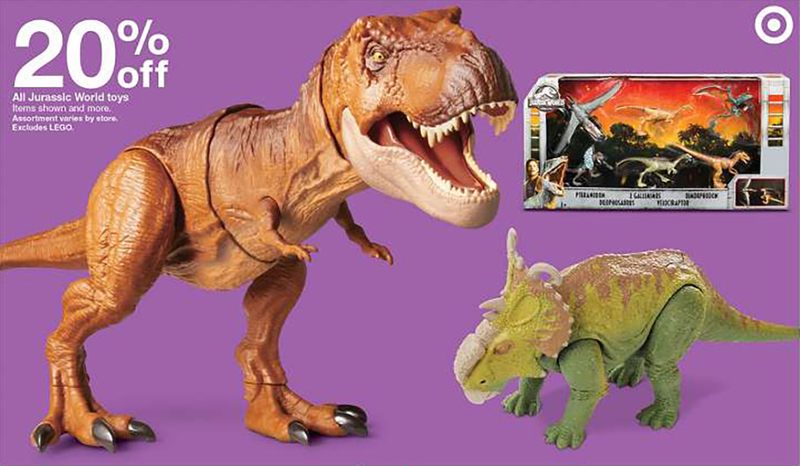 If you’re ready to import more dinosaurs into your park, this deal can be found both in store and on Target’s site. Happy hunting! Damn, I paid full price just the other day for the Bite ‘N Fight Rex, too >_< Oh well, not the first time I missed out on a good deal. Does this sale apply to the Legacy assortment, too? Head into Target with your receipt and they’ll do a price adjustment for you!